Zanjani, Y., Rafie Majd, Z., Mirzazadeh, A. (2015). Calculation of the fuzzy reliability in Neishabour train disaster; a case study. Journal of Industrial Engineering and Management Studies, 2(1), 1-15. Y.C. Zanjani; Z. Rafie Majd; A. Mirzazadeh. "Calculation of the fuzzy reliability in Neishabour train disaster; a case study". 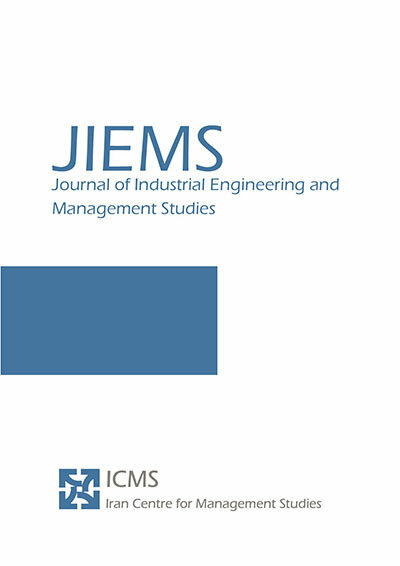 Journal of Industrial Engineering and Management Studies, 2, 1, 2015, 1-15. Zanjani, Y., Rafie Majd, Z., Mirzazadeh, A. (2015). 'Calculation of the fuzzy reliability in Neishabour train disaster; a case study', Journal of Industrial Engineering and Management Studies, 2(1), pp. 1-15. Zanjani, Y., Rafie Majd, Z., Mirzazadeh, A. Calculation of the fuzzy reliability in Neishabour train disaster; a case study. Journal of Industrial Engineering and Management Studies, 2015; 2(1): 1-15. Fuzzy reliability is often used in analyzing the reliability in the large industrial systems. In this paper, a relatively new method is presented to analyze Neishabour (also called Nishapur, a city in Iran) train disaster. In this regards, by using the certain and uncertain propositions, unreliability circuit of the system is depicted .Due to the inability to provide exact values for the unreliability of each subsystem, regarding the opinion of experts, fuzzy logic is applied and triangular and Gaussian membership functions are attributed depending to the type of each subsystem and the fuzzy unreliability value of the system is calculated. Finally, by defuzzification and comparing the obtained value with the classification table of linguistic variables, unreliability of the system is identified. Applications 38, 3640–3646.Akbari M, Ghiasvand S., Soleimani M., 1388, “Safety Equipment, Rail Systems”, Journal of Railway Research Center. Industrial Dust Explosion Phenomena”, 7th International Conference of Industrial Engineering, Isfahan. Alipour Dashbolagh Z., Monfared M.A.S., 2010, “Dust explosion phenomena and the processes and systems”, industrial maintenance, 6th maintenance Conference. Aven.T, 2011, “Interpretations of alternative uncertainty representations in a reliability and risk analysis context”, Reliability Engineering and System Safety, 96, 353–360. Bag S., Chakraborty D. , Roy A.R. , 2009, “A production inventory model with fuzzy random demand and with flexibility and reliability considerations”, Computers & Industrial Engineering 56,411–416. Bai X. , Asgarpoor S. , 2004, “Fuzzy-based approaches to substation reliability evaluation”, Electric Power Systems Research, 69, 197–204. Bertolini M., 2007 , “Assessment of human reliability factors: A fuzzy cognitive maps approach”, March 2007, International Journal of Industrial Ergonomics 37, 405–413. Bing L. , Meilin Zh. , Kai X., 2000, “A practical engineering method for fuzzy reliability analysis of mechanical structures”, Electric Power Systems Research 53, 133–138. Biondini F. , Bontempi F. , Malerba P. G. , 2004, “Fuzzy reliability analysis of concrete structures”, Computers and Structures, 82, 1033–1052. Brauer, Roger L., 2006 “Safety and Health For Engineers, A JOHN WILEY & SONS, INC.”, PUBLICATION. Cai K. Y., 2000, “Towards a conceptual framework of software run reliability modeling”, Information Sciences 126, 137-163. Chen H., Lou X., 2012, “A new fuzzy parameters reliability analysis model, Physics Procedia”, International Conference on Applied Physics and Industrial Engineering, 2286–2292. Chiang J. H. , Chen Y.Ch. , 2002, “Incorporating fuzzy operators in the decision network to improve classification reliability”, Computers and Electrical Engineering 28, 547–560. Craig R., “Industrial fire protection handbook”, 2002, CRC Press LLC، Schroll. Dhillon B. S., 2006, “Maintain ability, Maintenance, and Reliability for Engineering”, by Taylor & Francis Group, LLC. Ding Y. , Lisnianski A. , 2007, “Fuzzy universal generating functions for multi-state system reliability assessment”, Fuzzy Sets and Systems 159 , 307 – 324. Dodagoudar G.R., Venkatachalam G., 2000, “Reliability analysis of slopes using fuzzy sets theory”, Computers and Geo-techniques 27, 101-115. Dutta P., Ali T., 2012, “Uncertainty Modeling in Risk Analysis: A Fuzzy Set Approach”, International Journal of Computer Applications, No.17, 35-39. El-Tamaly H.H. , Mohammed A. A. E. , 2006, “Impact of interconnection photovoltaic/wind system with utility on their reliability using a fuzzy scheme”, Renewable Energy 31 ,2475–2491. Faghih N., Najafi Y., 2004, “Fuzzy Reliability in Industrial Systems”; published by Nasim Hayat (in Persian). Fars news (3 Aban 1384-2005). Garg H., Rani M., Sharma S.P., Vishwakarma Y., 2014, “fuzzy optimization technique for solving multi-objective reliability optimization problems in interval environment”, Expert Systems with Applications, 3157–3167. Gonzalez-Gonzalez D. S., Praga Alejo R. J., Cantú-Sifuentes M., Torres-Treviño L. M., Méndez G.
M., 2013, “A non-linear fuzzy regression for estimating reliability in a degradation process”, Applied Soft Computing, available online. Görkemli L. , Ulusoy S.K. , 2010, “Fuzzy Bayesian reliability and availability analysis of production systems”, Computers & Industrial Engineering 59 , 690–696. Goel L., Wu Q. ,Wang P. , 2010 , “Fuzzy logic-based direct load control of air conditioning loads considering nodal reliability characteristics in restructured power systems”, Electric Power Systems Research 80, 98–107. Hurtado J. E., Alvarez D. A., Ramírez J., 2012, “Fuzzy structural analysis based on fundamental reliability concepts”, Computers & Structures, 183–192. Huang H. Z. , Zuo M. J.,Sun Zh. Q. , 2006, “Bayesian reliability analysis for fuzzy lifetime data”, Fuzzy Sets and Systems 157, 1674 – 1686. IRNA news agency (29 Bahman 1382- 2003). IRNA news agency (7 Esfand 1382-2003). Jiang Q., Chen Ch. H., 2003, “A numerical algorithm of fuzzy reliability”, Reliability Engineering and System Safety 80, 299–307. Jun S., Zhenzhou L., 2008, “Moment Method Based on Fuzzy Reliability Sensitivity Analysis for a Degradable Structural System”, Chinese Journal of Aeronautics 21, 518-525. Junhong W., Jianqiao Ch, Rui G., 2006, “Fuzzy Reliability-Based Optimum Design Of Laminated Composites”, Acta Mechanica Solida Sinica, 255-263. Keshavarz E., Khorram E., 2009, “A fuzzy shortest path with the highest reliability”, Journal of Computational and Applied Mathematics 230, 204-212. Khanmohammadi S., Sadeghpour Khameneh H., Lewis H. W., Chun-An C., 2013, “Prediction of Mortality and Survival of Patients After Cardiac Surgery Using Fuzzy”, EuroSCORE System and Reliability Analysis, Procedia Computer Science , 368–373. Kumar M., Prasad Yadav Sh., 2012, “A novel approach for analyzing fuzzy system reliability using different types of intuitionistic fuzzy failure rates of components”, ISA Transactions , 288–297. Konstandinidou M. , Nivolianitou Z. , Kiranoudis Ch. , Markatos N. , 2006, “A fuzzy modeling application of CREAM methodology for human reliability analysis”, Reliability Engineering and System Safety 91, 706–716. Lin Q. L., Wang D. J., Lin W. G., Liu H. C., 2014, “Human reliability assessment for medical devices based on failure mode and effects analysis and fuzzy linguistic theory”, Safety Science, 248–256. Luyi Li, Zhenzhou Lu, 2013, “Interval optimization based line sampling method for fuzzy and random reliability analysis”, Applied Mathematical Modeling, 221-232. Mahapatra G.S., Roy T.K., 2006, “Fuzzy multi-objective mathematical programming on reliability optimization model”, Applied Mathematics and Computation 174, 643–659. Madani F. M., Zanjani Y. C., Majd Z. R. , Alipur Dashblagh Z., 2011, “The Occurrence of Runaway Freight Train Accident Neishabour in terms of Reliability with both Deterministic and Fuzzy Vision”, Maintenance Conference, Tehran. Mehr news agency (30 Bahman 1382-2003). Mehr news agency (16 Esfand 1382-2003). Mehr news agency (29 Bahman 1382-2003). Mohanta D.K., Sadhu P. K. , Chakrabarti R., 2004, “Fuzzy reliability evaluation of captive power plant maintenance scheduling incorporating uncertain forced outage rate and load representation”, Electric Power Systems Research 72, 73–84. Moller B., Beer M., Graf W., Sickert J.U., 2006, “Time-dependent reliability of textile-strengthened RC structures under consideration of fuzzy randomness”, Computers and Structures 84 585–603. Moller B. , Graf W. , Beer M. , 2004, “Discussion on Structural reliability analysis through fuzzy number approach, with application to stability”, Computers and Structures 82, 325–327. Narasimhan S. , Asgarpoor S. , 2000, “A fuzzy-based approach for generation system reliability evaluation”, Electric Power Systems Research 53, 133–138. Ni Z., Qiu Z., 2009, “Hybrid probabilistic fuzzy and non-probabilistic model of structural reliability”, Computers & Industrial Engineering 58, 463–467. Savoia M., 2002, “Structural reliability analysis through fuzzy number approach, with application to stability”, Computers and Structures 80, 1087–1102. Shavandi H., 2006, “Fuzzy set theory and its application in industrial engineering and management”, published by Gostaresh Danesh (in Persian). Taheri S.M. , Zarei R. , 2011, “Bayesian system reliability assessment under the vague environment”, Applied Soft Computing 11, 1614–1622. Tajeddine A, Kayssi A, Ali Chehab A, Artail A, 2011, “Fuzzy reputation-based trust model”, Applied Soft Computing 11, 345–355. Unver H. O. ,Wendel G. , 2009, “A fuzzy quality control-decision support system for improving operational reliability of liquid transfer operations in laboratory automation”, Expert Systems with Applications 36, 8064–8070. Verma A. K., Srividya A., Deka B. C. , 2005, “Composite system reliability assessment using fuzzy linear programming”, Electric Power Systems Research 73, 143–149. Viertl R. , 2009 , “On reliability estimation based on fuzzy lifetime data”, Journal of Statistical Planning and Inference 139, 1750 – 1755. Wang Z. , Huang H. Z. ,Du L. , 2011 , “Reliability analysis on competitive failure processes under fuzzy degradation data “, Applied Soft Computing, 2964-2973. Wu H. Ch., 2006, “Fuzzy Bayesian system reliability assessment based on exponential distribution”, Applied Mathematical Modeling 30, 509–530. Yadav O. P. , Singh N. , Chinnam R. B. , Goel P. S. , 2003 , “A fuzzy logic based approach to reliability improvement estimation during product development”, Reliability Engineering and System Safety 80, 63–74. Zanjani Y. C., Monfared M.A.S., 2010, “Reliability of the of man - machine review System:Neishabour train accident 82”, 7th International Conference of Industrial Engineering, Isfahan. Zhou J., 2005, “Reliability assessment method for pressure piping containing circumferential defects based on fuzzy probability”, International Journal of Pressure Vessels and Piping 82, 669–678.